Dubliner Nathan McGauran has picked up the sixth 2018 Dunlop Masters Superbike Championship Young Racer of the Year nomination. 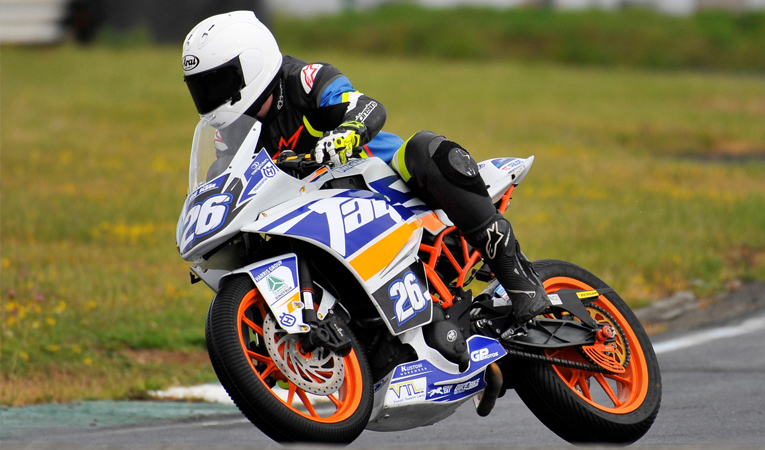 Nathan received his award at the second of two Masters events at Mondello Park in August, following some strong performances in the Junior Cup class. Nathan is in his third year racing on circuits and is competing in the Junior Cup class for the first time. Having started during 2016 in the Young Guns category the Clonsilla teenager continued in that class for the following year, where he scored his first race win. Moving to the more competitive Junior Cup category for 2018, Nathan has been building his speed all season as he gets used to his KTM machine. Prior to the August Masters Nathan had achieved a string of podium placings and was moving closer to the front at every event. Starting on the front row for each race the fifteen year old put in his strongest challenge yet for a Junior Cup win, taking second place in each of the first two races of the weekend. For the final encounter Nathan was in determined mood and pushed hard for his maiden win. Having spent the entire race swapping places with championship leader Jamie Lyons, Nathan over did it at the end of the penultimate lap and crashed out but had still done enough to get the vote from the competition judges. Following his nomination, Nathan McGauran joins Aaron Wright, Caolán Irwin, Jamie Lyons, Eoin Collins and Kevin Baker in the Young Racer of the Year final which will take place in October. As part of his prize he will also receive a free entry, testing and garage space for the final Masters event of the year in September. For more information on the Young Racer Award see HERE.